Well there is a way to learn about the cultural and natural history of the Preserve, that is almost like hearing it from the trees. 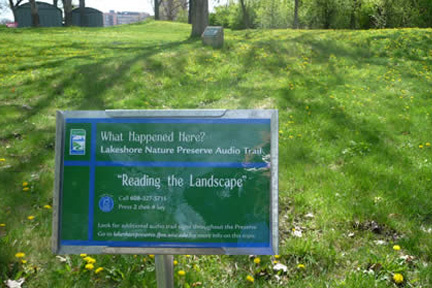 Next time you are wondering about the Preserve and you come across a “story spot” marked by one of these small 6 X 10 inch signs, take out your cell phone and give us a call to hear a narrated recording. Just follow the recorded prompts. There is NO CHARGE to you–just whatever your carrier charges for normal airtime. You’ll hear a 2 minute (or shorter) recording on a variety of topics. There are tales about what happened a thousand years ago and stories about on-going projects. The Class of 1918 Marsh Audio Field Trip (#20-35) was created in memory of Professor Stanley Dodson who died in 2009. Professor Dodson believed that small, shallow waters like this marsh were especially useful to help people of all ages understand the relationship between a water body and its surroundings. This field trip is developed around the way he might have introduced you to the marsh, and its life, as he did for so many students. The Class of 1918 Marsh Audio Field Trip was made possible by contributions to, and efforts of, the Friends of the Lakeshore Nature Preserve. Why not make a treasure hunt excursion out of trying to reach all of the “story spots?” Print an Audio Trail Map. You can listen to the stories right now! 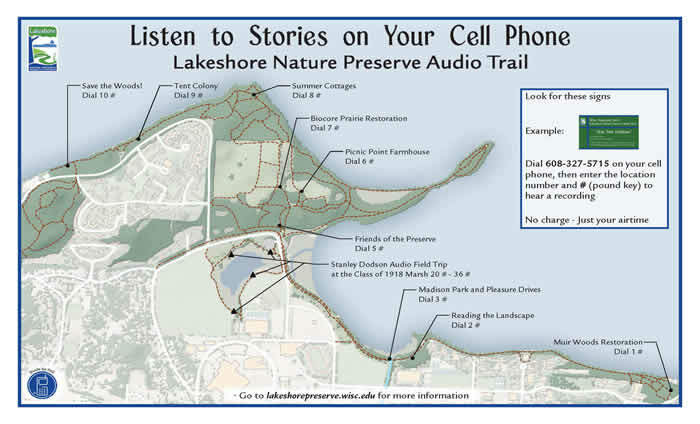 You can listen to the recordings online or download them to your mobile device and listen to them as you walk the Preserve.